Eshe is back and this time, she has the option of bringing some friends. When Thunder Lotus Games first come on the scene with Jotun (now better known as Jotun: Valhalla Edition,) it was a hand-drawn delight that earned the studio a lot of attention. They might not be as big as Image and Form or Zoink, but there was plenty of interest on what the studio would release next and that second game, was Sundered. Previously released last year (2017) on July 27 for PlayStation 4 and PC, Sundered is a metroidvania that is strong with Lovecraftian horror elements (cosmic horror of the unknown.) Like Jotun, it is a hand-drawn delight that comes packed with locations of differing visual presentations and imagery that perfectly capture just how twisted and corrupt the world of Sundered really is and just in case the graphics alone aren’t even, even the alluring soundtrack does a wonderful job of hammering in the suspense of the unknown! In the initial release, players would assume the role of Eshe, a woman traversing a desert during a sandstorm, only to then wind up in a truly horrific world. A world where she is forced to endure side-scrolling locales in a bid to acquire abilities and uncover a disturbing truth pertaining to a war, the Valkyries, and what became of the Eschatons. During your journey through a nightmare landscape, players will be able to encounter two kinds of areas, the first being pre-designed rooms and the other being procedurally generated areas that change every time the player dies. 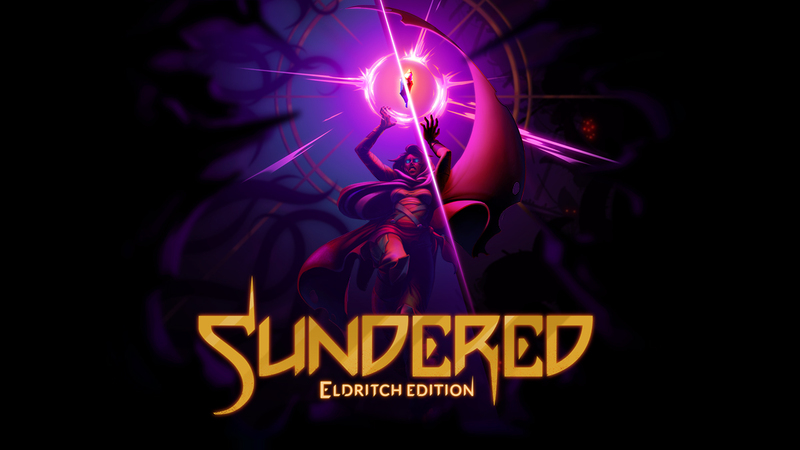 Now, as far as Sundered: Eldritch Edition is concerned, the above premise is still present, except in the new release for Nintendo Switch and Xbox One/content update for the PlayStation 4 and PC versions of the game, Sundered has a few more things to offer. Whereas before players would only be able to play through Sundered on their own and having to rely on their skills and wits to even stand a chance during the dramatic boss battles against larger than life bosses, now you can play with a friend or three thanks to local co-op. There is also a new boss to defeat and new areas to explore thanks to the Magnate of the Gong update. Admittedly, the majority of my gameplay consisted of myself playing on my lonesome as I wanted to play the game as originally released, but the local multiplayer aspect is certainly appealing if you have someone to play it with. Back to gameplay, Sundered is a game that revolves around four principles, Explore, Fight, Die, Upgrade. As a metroidvania where players are encouraged to explore the game’s three different regions and defeat each one’s three mini-bosses and main boss, before accessing a fourth region, there is a lot to see. In fact, a regular playthrough of Sundered could take you around 12 hours with up to 22 hours just to try and do everything. Not every location will be available to you from the get-go however, as players will need to locate shrines so as to acquire abilities that will allow them to reach newer areas to explore/shortcuts that can now be unlocked. Should you ever find yourself getting stuck, players are encouraged in-game to always try exploring another region/area. With regards to second principle Fight, whether it’s against the game’s mini-bosses, bosses and hordes (vast amount of enemies that will randomly spawn and hound you,) there is always someone or something to do battle against unless you wish to run. By relying on the A button, players can perform a dodge, which when used, gives the player temporary invincibility. Of course, you can always use B to jump. When death comes for you and it most certainly will, it is by no means the end, for death and dying is a key part of the Sundered experience. Every time you die, you will be returned to the sanctuary, where you can then spend the shards you have collected from smashed crates, destroyed treasure troves, defeated enemies and crushed objects. Falling under the Upgrade premise of Sundered, the skill tree is a great way to accumulate more health, how many perks you can carry (collect more shards and etc.) and upgrade a range of stats and abilities, before you head out to explore once again and start the Explore, Fight, Die and Upgrade loop all over again. The skill tree is not the only bit of upgrading that takes place in Sundered however, as defeating the game’s mini-bosses and bosses will allow you to get items called Elder Shards and what you do with each Elder Shard matters and this is where the whole “Resist or Embrace” factor comes into play. By trading in Elder Shards (and their humanity,) players can corrupt their abilities to become incredibly powerful. Not only does this help to make Sundered easier for yourself, but it will also allow you to get one of the game’s specific endings and a showdown against a boss specific to that ending. If you choose to not use any of the shards however, as you opt to destroy them, you can then go on to get a different kind of upgrade to your abilities and end the game with a final battle against a different boss and view a different ending. In the event you only corrupt some abilities and don’t use all the Elder Shards, then you will get the third ending the game has to offer, which is more neutral and also has its own unique boss. For the most part, Sundered does almost everything right, but there are a spatter of issues throughout. As fluid as the combat is, the hordes can feel a little too much at times that on some playthroughs, you might only traverse a short distance before getting swarmed and meeting for a very quick end and having to start again. There also instances where too many enemies can result in a slowdown when playing in handheld mode, but the biggest crime going, is the randomisation of the game itself. Sundered has some truly beautiful pre-designed locations, but after a while, the randomised rooms between them can feel a little underwhelming, but still, that is not a reason you should let put you off what is otherwise a brilliant title! I have waited a long time for a Switch port of Sundered and that patience has paid off. The Switch release of Sundered: Eldritch Edition the perfect port, or necessarily be the best version of the game, but it is without a doubt an enchanting, yet deadly metroidvania that demands lovers of the metroidvania genre to pick it up and give it a go. It lived up to my expectations and if you give it a chance, it should live up to yours also!